Save 10-20% with our Package Plans! With every client, we are aware of the difference that getting organized makes in people's lives. Call us today to get started! 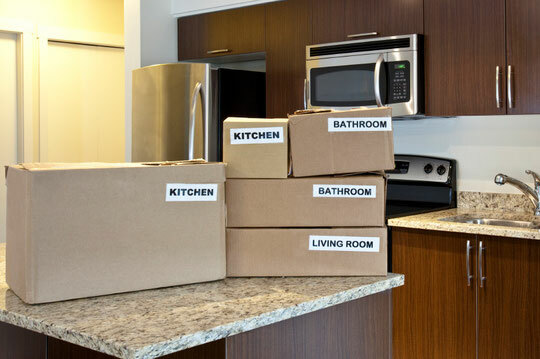 If you're planning for a move, or just survived one, we can help bring order and sanity! LivingSpaces Organizing services are billed by the hour. Our basic rate is $65 per hour. (There are some exceptions for special cases, see below). However, we are pleased to offer you the option to SAVE 10-20% with our Pre-Paid Package Plans, which start at 10 hours. Unless you pre-pay, hours are due on the day that service is provided. • DIRTY/HAZARDOUS CONDITIONS: At our discretion, due to the more demanding and potentially dangerous and sometimes unpleasant working conditions that are inherent in some spaces, there is a 10-20% surcharge over our hourly rate for projects that are excessively dirty, labor intensive, or involve more extreme working conditions. This refers to spaces with strong odors (including smoke and pet odors), excessive dirt, dust and fur, extreme heat or cold (i.e. having to wear a coat and our noses are running! ), or with insects and rodents. Many garages, attics, sheds and unfinished basements fit in this category, but sometimes homes do, as well. And of course, we reserve the right to not get involved with some projects that are beyond our scope. • SUNDAYS and URGENT SCHEDULING NEEDS: We are available for scheduling Monday-Friday, with some availability on Saturdays. SUNDAY scheduling and RUSH scheduling (i.e. where we re-arrange our schedule for you due to your URGENT situation) is available for $75/hour. Our most popular payment option is with our Pre-Paid Package Plans. If you are committed to the process of transformation in your Living Spaces and have a big project on hand, we offer you a great value. For example, on the purchase of 40 hours, you'll save $520! • Hours must be paid for in advance, prior to the start of any scheduled hours that the Package Plan applies to. • Used within 6 months, in minimum of 3 hour increments at a time. • Package Plans purchases and unused hours are non-refundable. • Each Package Plan purchase stands on its own. Thus, additional hours purchased are not added on to the previous package. • Hours are not applicable for cost of purchases made by LivingSpaces on behalf of clients. • We have a 24+ hour cancellation policy, with notice required by 9 a.m. on the day PRIOR to your cancellation. This includes situations of illness or emergencies. Without this notice, client forfeits HALF the scheduled hours that the cancellation pertains to. • For recurring schedule changes or cancellations (i.e. 3 within a 1 month period) even with proper notice time, there is a $10 fee per cancellation/adjustment. • Rates include client destinations of up to 25 miles, each way. For destinations beyond 25 miles, an additional charge of $.55 per mile applies, each way. • For destinations in the Foothills with mountain roads and driving conditions that are necessarily slow going, there is a driving time charge of $10 per 15 minutes, after the first 25 minutes of drive time each way (even if under 25 miles distance). • Payment for services are due on day that services are provided, unless purchased with Package Plan which are pre-paid. • To accommodate people's work lives, we are available for scheduling on some weekends, as needed. • Preferred method of payment is by Check. Credit Card are accepted, at our discretion. • Clients are asked to pre-pay for purchases for organizing products made on their behalf. There is a 5% surcharge on purchases made for clients with LivingSpaces' funds. • Shopping time for clients is billed at our hourly rate.